Jay Andrews and David Miller talk about health care on a weekly radio show. Doctor of psychology David Miller’s radio broadcasts produce none of the comic hijinks of fictional radio shrink Frasier Crane in the old TV sitcom. On the air, the Brenau professor is all business. The underlying premise of the weekly program hosted by the Brenau health care M.B.A. director is that the health care landscape changes so rapidly these days that most people are not even sure of the issues they need to be watching out for. That is a topic that interests Miller greatly – and not because he believes, as some might suggest, that any politicians who tackle the national health care issue need to have their heads examined. Because of ever-increasing administrative responsibilities as a clinician earlier in his career, Miller gained enough experience to qualify him to be lead professor and director of Brenau University’s highly acclaimed Master of Business Administration health care specialization. Like other health careers, health care administration is considered virtually recession-proof with enormous growth. Health services will approach 20 percent of the U.S. gross domestic product by 2017. With the implementation of “Obamacare,” or the highly controversial Affordable Care Act, health care police and administration ranks right up there with domestic surveillance and illegal immigration as a key and divisive U.S. domestic policy issue. Asked which qualities make a good candidate in this field, Miller emphasizes the ever-changing nature of the health care landscape. “It’s not for the faint of heart!” he says. Health care administration is a cumbersome and tedious process, whether it involves overseeing the Veterans Administration hospital system or figuring out how to convince your employer’s group health insurance provider that anesthesia for your colonoscopy is not really a frivolous elective procedure. That complexity is part of the reason Miller agreed to undertake Health Matters, a 9 a.m. program every Monday on Brenau’s WBCX-FM radio station. The underlying premise of the program, says Miller, is that the health care landscape changes so rapidly these days that most people are not even sure of the issues they need to be watching out for. Preparation for health care professions has become one of Brenau’s academic sweet spots. Its three doctoral programs are in nursing, occupational therapy and physical therapy; the fastest-growing Women’s College undergraduate segment has been in health sciences. Miller kicked off the program with interviews with Gale Starich, dean of the College of Health Sciences; Barbara Schell, soon-to-retire head of Brenau’s highly vaunted occupational therapy school; Dina Hewitt, head of the School of Nursing; and, from the Department of Physical Therapy, professors James Lewis and Tracy Wright. 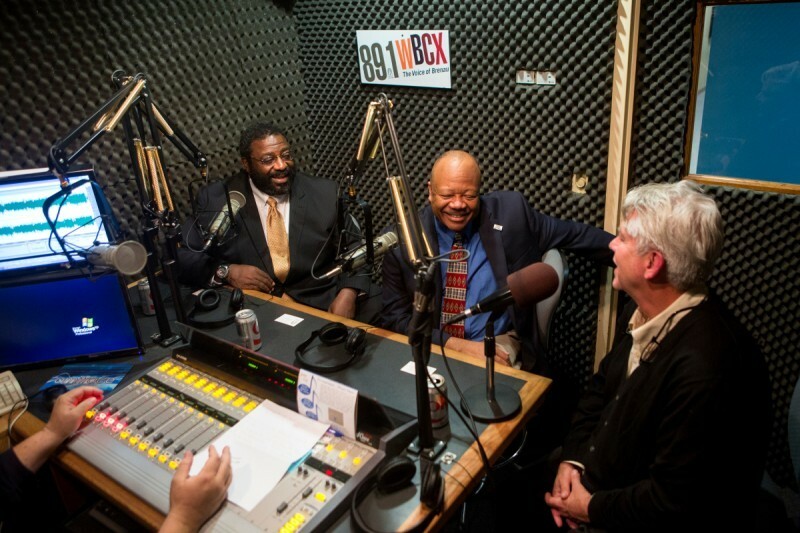 Before starting his regular program, Miller frequently conducted interviews on WBCX with health care professionals in the news like Dr. Frank Glover, left, an Albany, Georgia, urologist who is one of the world’s leading experts on managing global epidemics of the Ebola virus. Glover was accompanied in the studio here by Dr. Al Panu, an administrator at University of North Georgia. However, he also has had representatives from the health insurance industry in both overviews of the industry. Future program plans involve tapping his extensive network to develop topics about drugs, patient empowerment and employee wellness programs, as well as to attract political and government leaders engaged in the issue. Georgia Sixth District U.S. Rep. Tom Price, a physician from North Georgia’s Sixth District who chairs the House Budget Committee, for example, authored a bill proposing a drastic alternative plan to President Obama’s Affordable Care Act. Georgia Gov. Nathan Deal, like other Republicans around the country, refused to lead full implementation of ACA. Also, the entire Republican majority in the Georgia House of Representative delegation oppose Obamacare and many of them have voted along with their Republican colleagues in the House 55 times to repeal it. The state’s two U.S. senators also oppose ACA, but the senate has only cast a scant three dozen votes against Obamacare. ACA is a central issue in 2016 president politics with all the myriad Republican candidates vowing to repeal it. On the Democratic side, contenders do not see eye to eye: Vermont U.S. Sen. Bernie Sanders wants to expand the concept to a single-payer system, like Medicare, and former Secretary of State Hillary Clinton – who received a thorough political smackdown as first lady running a proposal for national health care for her husband during the first Bill Clinton administration – proposes refinements and expansion to the Obamacare program. Brenau has more than 600 students pursuing MBAs with more than 80 in health care management. In 2010, almost 100 years after the health care issue noisily cudgeled the Republican president who always wanted to speak softly and carry a big stick, President Obama signed into law the most revolutionary change since the passage of Medicare and Medicaid in the 1960s. Suddenly, Miller, the health care administration professor, had some tricky, new bureaucratic terrain to navigate. He started by conducting the equivalent of “exit interviews” with graduates of Brenau’s program, such as Steve McNeilly, BU ’12, executive director of Northeast Georgia Health Partners, who earned his degree the semester before Miller assumed his post in the fall of 2012. Prof. Miller struck me as an out-of-the-box thinker with fresh ideas, so I was sure he was going to do interesting things. Miller, who has a leonine mane of white hair and a fondness for bow ties, grew up in St. Louis, really has little academic background in business, finance or liberal arts. He studied psychology and philosophy at the University of Missouri at Columbia, and finished his doctorate at Stanford. He did his residency at the Veterans Administration in Palo Alto, California, where he specialized in post-traumatic stress disorder among former prisoners of war. Miller went on to run the VA’s National Center for the Evaluation and Treatment of former POWs in Pittsburgh and then, in Atlanta, to oversee VA research for the Southeast. He also served as associate professor of psychiatry and cardiothoracic surgery at Emory University and the University of Pittsburgh medical schools. His wife, Sue, also has a Ph.D. in clinical psychology, and she runs a private practice in Alpharetta specializing in autism. “Delta Sky Miles knew me by name, I was traveling so much,” he says. Miller, left, participated in last spring’s program in Pearce Auditorium with former GE CEO Jack Welch, his wife Suzy and Brenau President Ed Schrader. Miller is quick to note that the university “gambled” when it hired him, especially during a tumultuous time in the economy and the health care industry. What stacked the deck in his favor, however, is that substantial curriculum vita that testifies to his practical and studied expertise in health care delivery as both a clinician and an administrator at high levels of leadership in a variety of agencies. Miller currently stays active with the Hall County Chamber of Commerce, with whom he coordinates and emcees an annual symposium on health care. (“If you want to know what will happen in health care – in, like, the next four hours – you need to attend,” he says wryly.) He occasionally does radio interviews and broadcast talk shows as a guest on other people’s shows, and one of his more interesting personal appearance gigs occurred on stage at Pearce Auditorium last spring when he and Brenau President Ed Schrader conducted an interview before an audience of about 700 with GE Corporation’s former CEO Jack Welch and his wife, Suzy. With his interdisciplinary background, Miller has a penchant for Brenau’s attempts to cross-pollinate the various academic silos. The M.B.A. program in health care ranks in the top 20 in the country, hovering close to Harvard and the University of Pennsylvania. Brenau has more than 600 students pursuing M.B.A.s with more than 80 in health care management – making Brenau’s M.B.A. enrollment the second largest in the state, according to rankings in the Atlanta Business Chronicle. “Health care was already a robust program [before I came],” Miller says, “but we completely overhauled the curriculum, moving it from an inpatient, fee-for-service model to one that takes into account prospective payment options under the ACA.” To ensure up-to-the-moment proficiency for the M.B.A. students, Miller has added an “advanced topics” course, which incorporates the research and positions of several diverse Washington, D.C.- based think tanks, including the Kaiser, Brookings, Heritage and Cato foundations and institutions.The program also is required for some graduate students in health care disciplines, such as occupational therapy. From left, State Rep. Kevin Tanner; Brenau 2013 occupational therapy alums Allison Guisasola, Rachel Strazynski Shusner and Shelby Wrenn; State Sen. Butch Miller; Barbara Schell, head of the Brenau OT program, and David Miller with Georgia Gov. Nathan Deal at a signing ceremony for the bill instigated as a project in one of Miller’s classes. “I try to draw from all over the political spectrum so they get a wide range of views, from liberal to conservative to libertarian,” he says. He also encourages students to learn by doing real things. For one class, four occupational therapy graduate students had to hone in on a real public policy issue, figure out a way to address it and pitch their solution to a couple of Georgia legislators who agreed to come to campus and, as a purely academic exercise, give students feedback on their idea. As it turned out, the lawmakers thought the idea had some legs. They introduced it as a real bill in the 2014 session of the General Assembly, working with the Brenau OT students to draft the bill. The idea was to extend state benefits equally to special-needs children of military families stationed in Georgia. The bill passed and, last spring, Gov. Deal had three of the four OT students at his side when he signed the bill into law at a special ceremony Brenau hosted at the Atlanta Press Club. Of fewer than a dozen U.S. Navy fleet surgeons from around the world, two are Brenau M.B.A. health care alums: Capt. Chris Culp, in background from left, and Capt. Joel Roos. The students in this M.B.A. program consist of a demographic mix of traditional and nontraditional types such as physicians, nurses and lab techs looking to advance to the next rung in their work. Some graduates are up to some exciting doings. One, Abe Prescher, BU ’14, in San Diego, was recently selected from 100 applicants from around the country for the lone 2016 fellowship in hospital administration at the Yale University medical center in Connecticut. Two others serve currently as fleet surgeons in the U.S. Navy: Capt. Joel Roos, BU ’09, the Sixth fleet’s top medical officer and Capt. Chris Culp, BU ’14, the Pacific Fleet’s top doc (Brenau Window will profile Roos and Culp in the next issue). “We are lucky to have so many students who are already in the trenches and can share what they’ve learned,” Miller says. Miller’s goals for the future include making Brenau’s program more interdisciplinary, combining business with OT, and business with psychology. And, of course, Miller, an avid outdoorsman, intends to stay fit by hiking, camping and trail-running. But does he practice what Twain preached?